When I released the first version SWEAT. on the TV app store I made a major mistake. That mistake was compounded by the lack of discoverability on the TV at launch and looking back on it could have led to me missing out on twice the downloads. That mistake was simply naming the app SWEAT. instead of something like it’s current name ‘SWEAT. - Workout and Exercise Routines’. 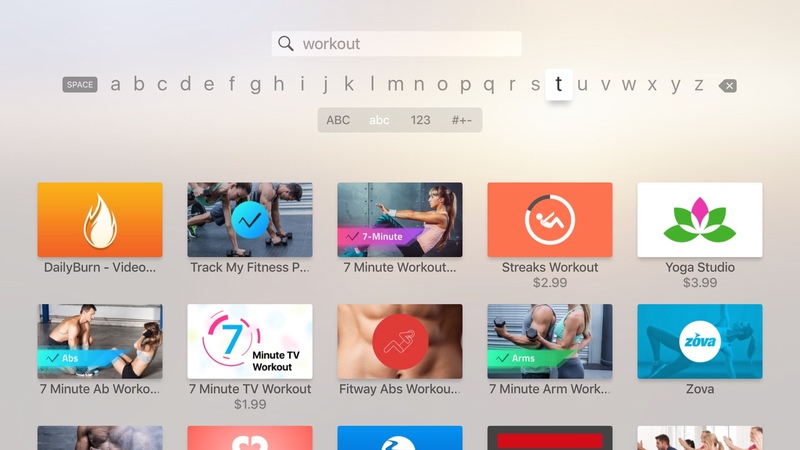 So on the surface that doesn’t seem like that big of a change but it starts feeling a bit bigger when you look at the search interface on the Apple TV. Just looking at that image I think we can all agree that being in the top 10 for a given search term is much more valuable than not. It’s the whole reason the most important news stories are above the fold, if you’re above the fold you have more visibility. So at the time that I decided I had a made a mistake and needed to update the name, I was the 17th result for ‘workout’ and the 12th result for ‘exercise’. For ‘workout’ that puts me below the fold and for ‘exercise’ that basically puts me in the fold. After my change (literally the day the update went out) SWEAT. was up to #9 when searching for ‘workout’ and #7 when searching for ‘exercise’. That’s prime real estate, above the fold, and on a platform where Search is the discovery engine your rank in search can’t be understated. So what can you or I learn from this tiny little mistake? First, really think about the keywords that you’re using for your app (Are they relevant? Will people actually search for them?). You can use a service like Sensor Tower to hep figure out which keywords you should be targeting. Second, don’t be afraid to include keywords in the name of your application. Don’t overdo it and be ridiculous but sprinkling a few strategic keywords in the name of your app can have a very serious effect on your downloads. If your left wanting to learn more about App Store Optimization, check out this blogpost by Dan Counsell or reach out to me on Twitter for more info.